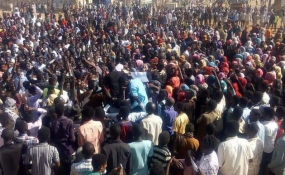 Khartoum / Dongola — Sudan's government has blamed nationwide protests that have left a score of people dead, including two protesters today, on 'infiltrators' and opposition parties, rather than the soaring prices. It has imposed disruptive measures in several states, and internet censorship nationwide, to halt the spread of the revolts. "Peaceful demonstrations were derailed and transformed by infiltrators into subversive activity targeting public institutions and property, burning, destroying and burning some police headquarters," government spokesman Bushara Jumaa said in a statement released by the official Sudan News Agency on Friday. "Some political parties emerged in an attempt to exploit these conditions to shake security and stability in order to achieve their political agenda," Jumaa said, without naming the parties. He added that the demonstrations had been "dealt with by police and security forces in a civilised way without repression or opposition". His statement is being objected to by people in Sudan including politicians, journalists and demonstrators. States of emergency were declared quickly on Wednesday in Atbara in River Nile, where two protesters were shot dead on Friday, in El Gedaref, and today also in White Nile, by state authorities trying to curb the spread of unrest. They have led to the closure of basic and secondary schools, universities, and markets. Khartoum state followed today with the closure of all universities for an unknown period of time, and all the basic and secondary schools have also been closed. It is noteworthy to mention that the demonstrations in Sudan this week are characterised by the participation of large numbers of university students. As for the internet blockade to social media that has persisted since Thursday evening, journalists and activists from Khartoum told Radio Dabanga on Friday afternoon that they have not been able to surf to social media platforms - only after the use of privately owned networks (VPN) as circumvention tool. There has been very slow internet access in general, they pointed out. Subscribers to the Sudanese Zain internet provider in particular face severe difficulties in using their instant messaging services on mobile phones such as WhatsApp. Zain, for its part, released a statement in Arabic on its Facebook page claiming that the blocking of some sites are caused by reasons that are "technical and outside of the scope of the company's competence". An international observatory of internet disruptions, NetBlocks, reported today about the technical evidence it found indicating the internet censorship imposed by the regime is aimed at suppressing the spread of communication and photographic footage which may spark further demonstrations. Social media platforms such as Facebook effectively saw relatively less photos and videos uploaded by protesters than in previous days. Civilians reported to Radio Dabanga the interruption of communication in Dongola, Northern State. In addition local authorities have banned the sale of recharge cards for mobile phones. "We have been completely cut off from the outside world and rely only on the television for information and news. It's humiliating us," a resident of Dongola said. Ashraf Abdelaziz, the editor-in-chief of El Jareeda newspaper, said that he had difficulties to communicate with reporters in the states and journalists in Khartoum. "I am surprised by the authorities resorting to this procedure, even though it recognised the legitimacy of the right to demonstrate to citizens." Sudanese press were officially warned against covering and publishing about the demonstrations in the country in a directive by the security apparatus (NISS) on Thursday, which has the authority to censor newspapers and detain journalists. El Jareeda was not allowed to publish today as it was forced to remove five pages by officers of the security apparatus at the printing presses this morning. "I received a call from a security officer asking me not to exaggerate the demonstrations in our coverage," Abdelaziz said. He and other editors-in-chief have been invited to meet with the NISS director on Friday night. "This is a blatant violation of the Media Charter of Honour recently signed by newspaper editors, and a violation of the freedom of expression," Abdelaziz concluded.